1. 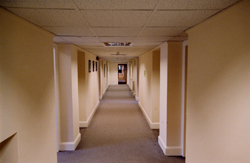 View of ground floor corridor. Consulting rooms lead off from it. 2. Consulting room view. Therapist is seated on the right, patient on the left. At Springfield a team of psychotherapists and psychologists focus on the treatment of persons with eating disorders. Though a majority of the patients are adolescent girls, the hospital sees a number of older men and women from a variety of cultural backgrounds. 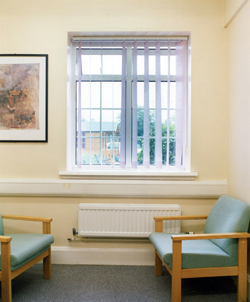 Typically, Springfield's psychologists use cognitive behavioural type therapies whilst psychotherapists favour psychodynamic type psychotherapies. Patients are usually assigned a psychologist and psychotherapist. Information obtained through telephone interview with hospital nurse.